Are you ready for BBQ fish? You might be asking, “do you barbecue everything?” My answer is that I try to. The whole BBQ fish thing started with fish Fridays at the McClure house a few months ago. I don’t like baked fish and it just seemed weird to fry fish when we are trying to eat healthier. The fish recipes I have chosen to share with you in this post are the two favorites in my house. My personnel favorite is tilapia, because it does not have a real fishy taste to it. The salmon also gets top billing, because it is a favorite of my wife and oldest son. You my be asking yourself, “does he get his fish at the Wagon Wheel Market too?” and the answer would be, “yes”. I’m in there every Friday, because that’s when they get there fresh fish delivered. Fresh fish it makes a huge difference in flavor! If you have access to a local fish market that’s the way to go. So just like in the last two recipes I start with Kingsford charcoal and mix in a few small pieces of cherry wood. I then return to the kitchen were the fun of trying not to smell like a fish begins. I start with the salmon because it takes about 10 to 15 minutes more to cook than the tilapia does. I begin by seasoning the salmon with sea salt because this neutralizes the fishy flavor I little bit. Then I season the fish with Santa Maria seasoning from, yes you guessed it, the Wagon Wheel. I also add lemon slices and rosemary from my yard. 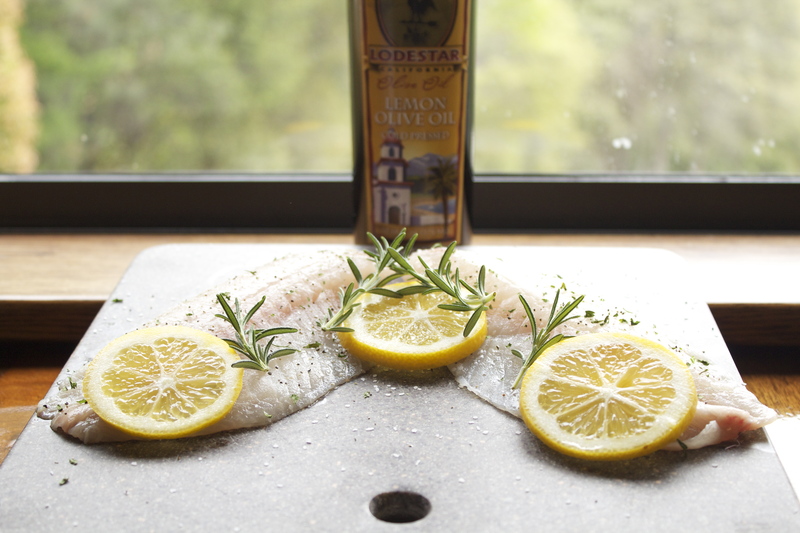 I top the fish off with lemon olive oil from Lodestar Farms. Then I give the salmon a little more kick by adding dill and some capers. The capers are an important ingredient, because they are my wife’s favorite. I add capers and dill to the tilapia, as well, but I wait until the salmon has been on the grill for ten minutes. I also like to dip my fish in J Lee Roy’s sea food sauce its has a nice heat to the fish. Before you place the fish on the barbecue spread the coals in half with a space in the middle, so there is no direct heat on your fish. Burnt fish is bad fish. 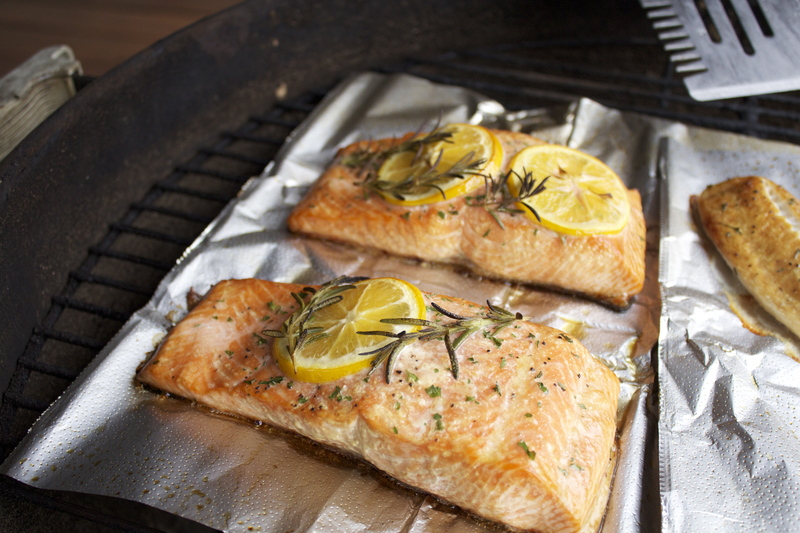 Place a piece of tin foil on the grill that is big enough to accommodate all the fish. Then add Lodestar lemon olive oil to the tin foil before placing the fish on the grill. 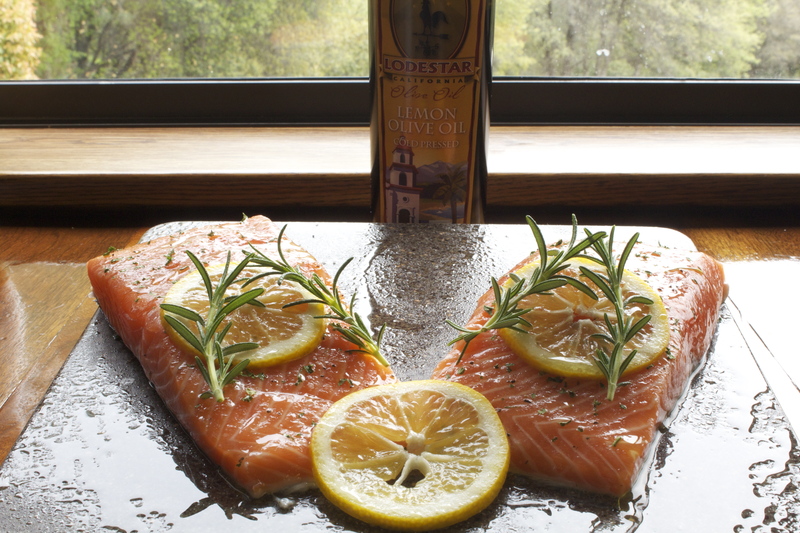 If you can’t find Lodestar lemon olive oil you can use a different high quality olive oil. 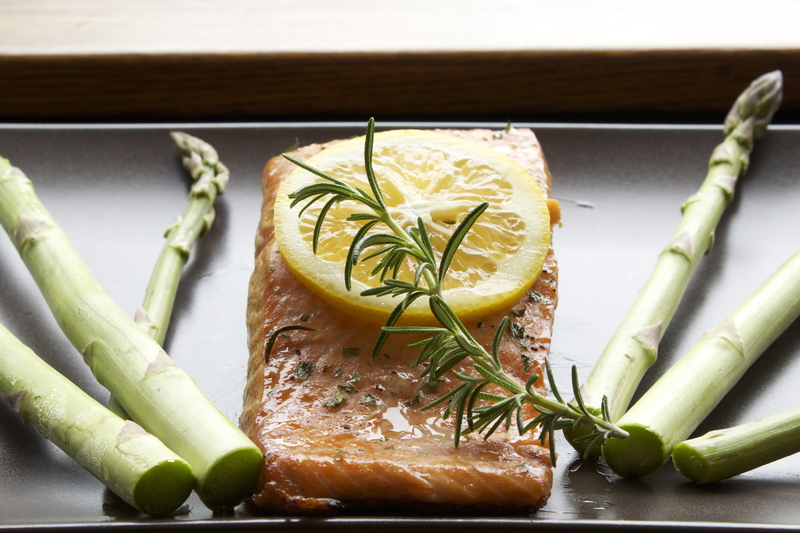 Now place the salmon on the grill,wait ten minutes and then add the tilapia to the grill, as well. 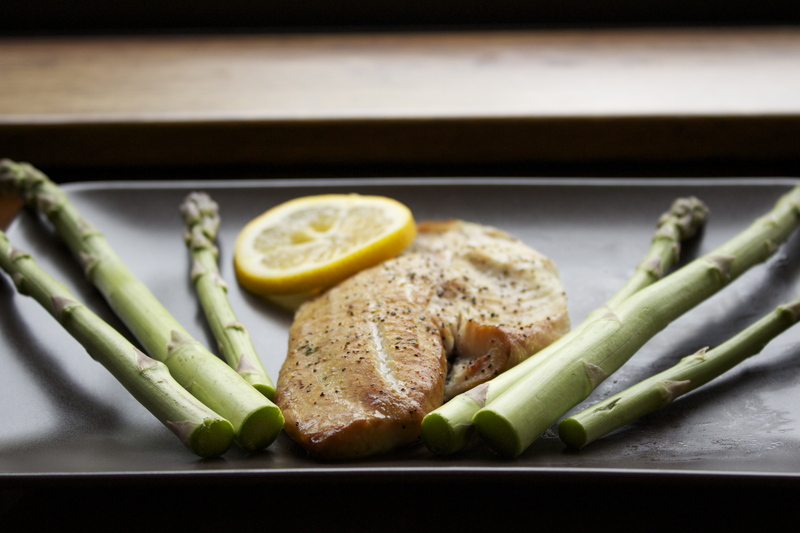 Once the tilapia is on the grill let both types of fish grill for thirty-five minutes. (forty-five minutes total for the salmon). You will know the fish is done when it starts to split. 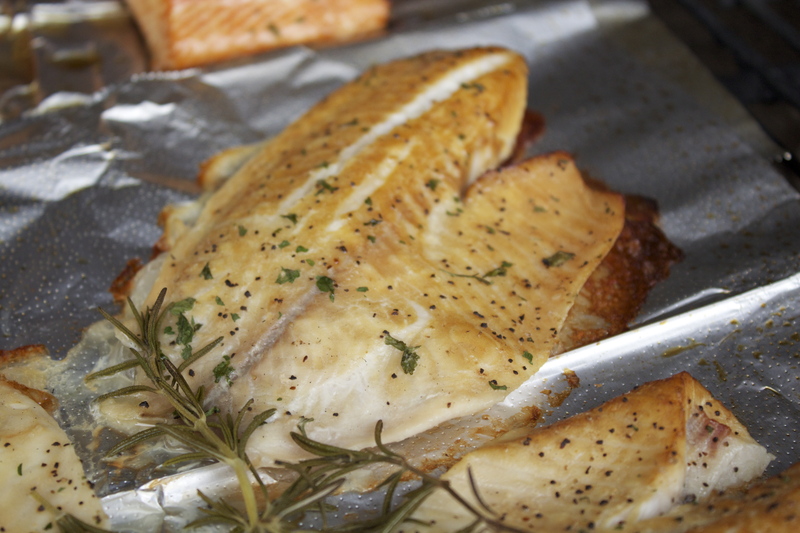 The fish will have a crispy bottom side and a great moist and tasty center that you will love!